Kellogg's popular pre-paid gas cards offer is back! 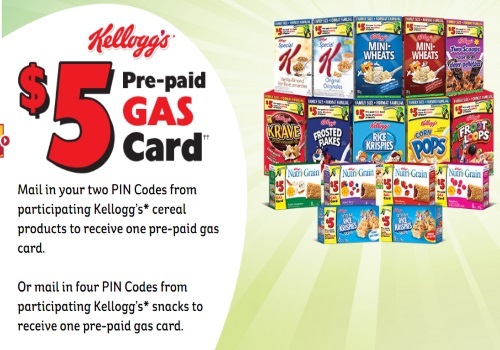 Get a Free $5 Pre-Paid Gas Card from Kellogg's when you redeem two PIN codes from participating Kellogg's cereals or four PIN codes from participating Kellogg's snacks! There is a limit of 5 requests per household. Promotion ends September 30, 2016 or while quantities last. The gas cards expire December 31, 2016. Allow 6-8 weeks for delivery. Check out the FAQ about this offer here.